Although their primary duty has always been to protect the organization, in-house legal professionals commonly wear two hats. In addition to their core responsibilities, they often are tasked with handling the administrative operations of the legal department. In the past, marrying these dual roles meant that this less substantive, ministerial work became less of a priority and was pushed down to lower levels or that this work was compartmentalized, leading to independent—and inefficient—silos. Today; however, things have changed. These days, legal professionals are expected to lead the charge in implementing corporate initiatives aimed at reducing costs, mitigating risk, introducing new technologies, and changing corporate culture. No longer are the administrative priorities secondary to the substantive work—they are an integral part of it. 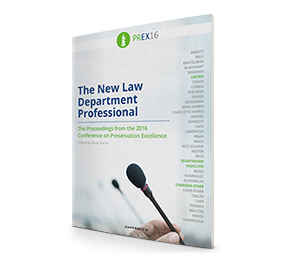 At the 2016 PREX, the premier conference for in-house ediscovery professionals, panelists discussed ways the new breed of law department professionals are helping to transform their department so it runs like a business, from ediscovery to information governance, and more. Dawn Radcliffe, Legal Operations Manager, TransCanada Pipelines, Ltd.